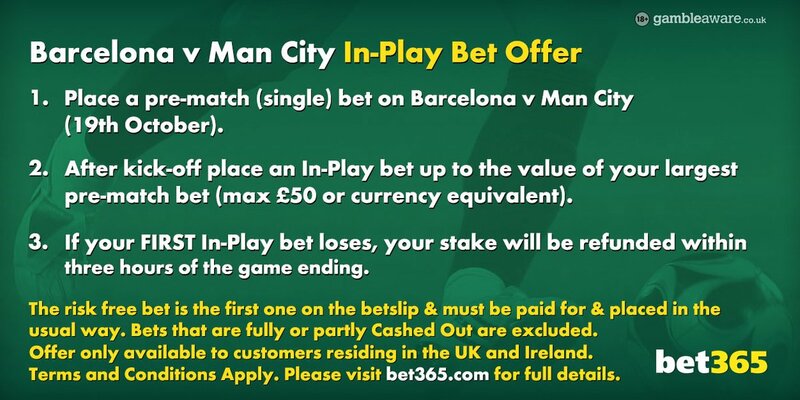 Barcelona v Manchester City goes underway at Camp Nou on Wednesday night and bet365 are back with their best promotion for both new and existing customers! Claim your £50 in-play free bet right now! 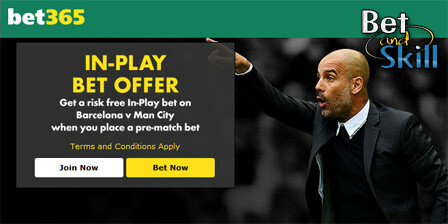 Just place a pre-match bet on Barcelona-Man City before the kick-off on any market and get a £50 free bet to use in-play as soon as the match starts! Fans of both clubs have been looking forward to this clash since the draw for the group stage was made, with former Barcelona boss Pep Guardiola returning to the Camp Nou with his Manchester City charges, but who will claim the bragging rights? Unlike many matched bet offers, this one is not restricted to new customers – existing bet365 clients can also take advantage of it! Place a bet on Barcelona v Manchester City before kick-off, then once the game starts at 7.45pm on Wednesday 19th October, place another bet on any In-Play market on the match. If your FIRST In-Play bet is a loser Bet365 will refund this stake, up to the same amount as your largest pre-match bet. This is not the case with bet365. If you win your in-play bet then you keep your winnings and if your bet loses then the stake (up to £50) will be credited into your account immediately. If your first in-play bet loses, bet365 will refund your stake up to the same value as your largest pre-match bet. This is a very generous offer so there are many ways in which you can get a massive profit! Please note: if you use the Cash Out facility either for the pre-match or in-play bet, either partly or in full, that bet will become ineligible for the offer. How to use the £50 free in play bet offer on Barcelona v Man City? There are various ways to go. You may opt to cover your first bet with an in-play wager against the initial selection, e.g. you could go for Manchester City/Draw double chance in-play to run alongside a pre-match Barcelona win bet, especially if the host fell behind fairly early. Considering the offensive talent these two clubs, you could back Over 3.5 pre-match at odds of EVS. Then your in-play choice could be to bet on Both Teams To Score as early in the game as possible. That could lead to a huge profit if the final score is 3-1, 2-2, 3-2 etc. This offer applies to bets placed on the Barcelona v Man City Champions League match, played on Wednesday 19th October 2016. Risk free bet value will be equal to the stake of your largest pre-match single bet placed on the Barcelona v Man City Champions League match, played on Wednesday 19th October 2016, up to a maximum of £50*. Pre-match bets that are fully or partly Cashed Out will not qualify for the offer, whether Cashed Out pre-match or In-Play. The largest pre-match bet that has not been fully or partly Cashed Out will qualify (up to £50*). Risk free bet will be deemed your first single bet placed In-Play on the Barcelona v Man City Champions League match, played on Wednesday 19th October 2016. If your first single In-Play bet is fully or partly Cashed Out, you will no longer be eligible to receive this offer. Note that 'pre-match' is defined as bets placed prior to kick-off of the Barcelona v Man City Champions League match, played on Wednesday 19th October 2016 and 'In-Play' is defined as any bet struck after the game has kicked off. "Bet365 offer £50 free in-play bet on Barcelona v Manchester City - Risk-free!"